The Moves Management Module gives you the ability to design, schedule, and carry out a set of contact “moves” for a group of donors. For example, you can create a plan to solicit donations from your major donors for your annual appeal. Each plan includes the specific set of actions (e.g., phone calls, emails, and meetings) you want to use to solicit your donors. With this module, you have the option to schedule each of these actions and assign them to different users in your system. As each action is completed, you’ll be prompted to schedule the next action in the plan. DonorPerfect Online’s secure web-based access means board members, staff and volunteers can work from home, the road, or at a top prospect’s home/office, and all follow the same plan! One centralized database enables everyone to work with the same data. DonorPerfect’s unique SmartActions business rules system helps staff meet the Moves Management goals by customizing and automating tasks. DonorPerfect’s flexible information management easily tracks unlimited data, notes and attributes for all your constituents. Grant reports and deadlines can go into the Moves Management module to ensure no milestones are missed during the grant process. Actions taken to identify, build relationships, and solicit contributions from prospective donors are known as ‘moves’; the administration of the strategies and methods of these actions is known as Moves Management. Utilizing a set of individual and organizational goals, a successful Moves Management campaign can be measured by an increase in personal communication and funds raised during a set period of time. How does it work in DonorPerfect? 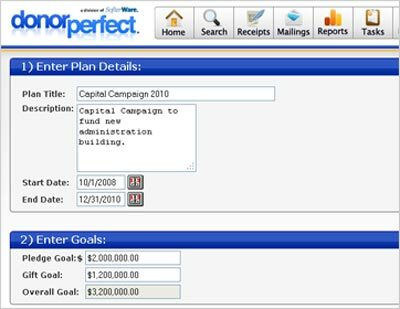 Using DonorPerfect Online’s robust donor tracking and contact management, each nonprofit can use the Moves Management module to identify prospects, set goals, assign solicitors, and carry out contact “moves” for a targeted group of donors. Every plan includes the specific set of actions (e.g., phone calls, emails, and meetings) that help build relationships and foster donations. Each action or ‘move’ can be scheduled and includes automated system reminders. When you create a Moves Management Plan, you enter the details of the plan, including goals, start and end dates, and the actions included in the plan. You can define the specific actions that are included in your plan (e.g., Mailing, Meeting, Telephone Call). When you create an action, the system tracks the action by creating a contact record for the affected donor. Once you’ve created a plan and defined each action in it, you can assign subsequent actions in the plan for groups or individual donors through their donor record.